3,000 Chicagoans marched on City Hall demanding justice for the 400 victims of police violence. Marchers represented the Black, Latino, Arab, Muslim, and many more communities who had been impacted by a history of Chicago Police shootings, torture, profiling, harassment and surveillance. The march was initiated by the CAARPR who have been fighting for a Civilian Police Accountability Council (CPAC) for many years. Now with the momentum built by CAARPR, Black Lives Matter Movement, We Change Genocide, Fearless Leading by the Youth (F.L.Y. ), Black Youth Project 100 (BYP 100), and many other organizations, Saturday’s march clearly demonstrated that the demand for civilian control over the Chicago Police has grown into a mass movement of solidarity between community organizations in the city. 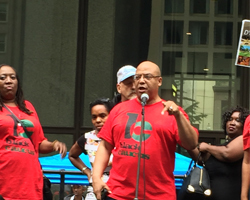 Michael Brunson from the Black Caucus of the Chicago Teachers Union compared the “undemocratic” nature of the current Police Board whose members are all appointed by the Mayor to the same unelected Chicago Public School Board that is closing schools and cutting funding for special education students. 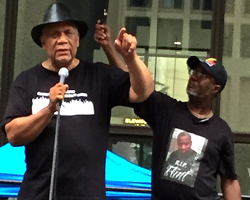 Brunson reminded the crowd of the 13-day-old hunger strike at Dyett High School in Bronzeville on the South Side. The hunger strikers are fighting for Dyett to remain open as the last publicly operated school in the neighborhood. 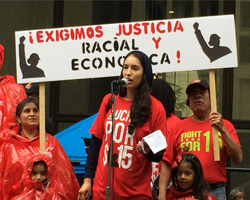 The Chicago Fight for $15 movement that organizes for a $15 minimum wage was also active in the march. A statement from McDonald’s worker Adrianna Alvarez was read to the crowd. 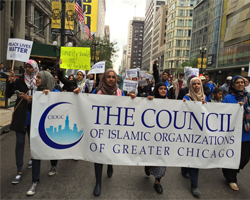 There was a large contingent representing Muslim organizations throughout the city that was mobilized by the Council of Islamic Organizations of Greater Chicago (CIOGC), a federation of over 60 greater Chicagoland Islamic organizations. 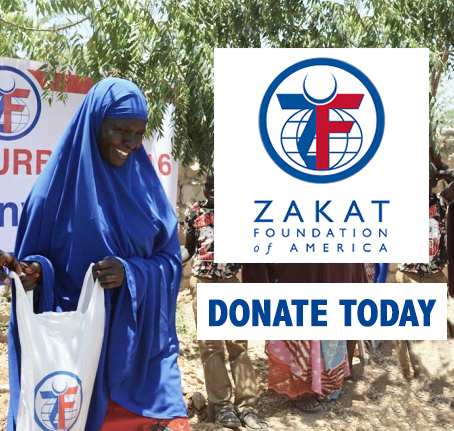 The CIOGC had organized buses from eight different mosques and community centers to bring people to the march. Members of the AAAN Youth Organizing Program have also traveled to Ferguson for the initial protests and during the one-year anniversary earlier this month. 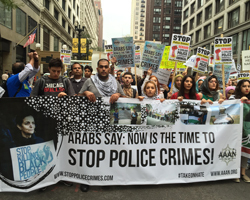 Recently, the Youth Organizing Program also launched an anti-profiling campaign for the Arab and Muslim communities in Chicago. 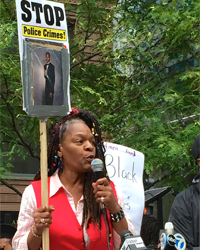 Along with the fight for community control of police, campaigns like the AAAN’s against profiling and the campaign to end “stop and frisk practices” initiated by We Change Genocide and the Black Lives Matter Movement are all aspects of communities seeking justice for victims of law enforcement violence. 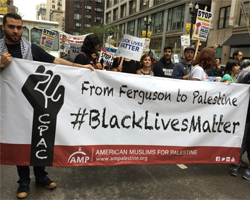 These community groups brought a multitude of issues to this march: stop racial profiling, stop and frisk, and surveillance of our communities; pay a minimum wage we can live on; fully support public schools in all neighborhoods; end the occupation of black neighborhoods and the occupation of Palestine. All of them point to democratic, community control over the policing, housing, schools, and jobs in every Chicago neighborhood. This is the only approach that can overcome the systematic racism that underlies all of these issues. Next articlePolicing Politicians: What Are the Presidential Candidates Plans for Immigration?